Pima Football en route to C.H.A.M.P.S. Even with the rough ending to the regular season, the Aztecs are bowl bound. The bowl game is C.H.A.M.P.S. Heart of Texas Bowl. The game will be played Dec. 1, at ISD Stadium, in Waco, Texas, versus the Kilgore College Rangers. 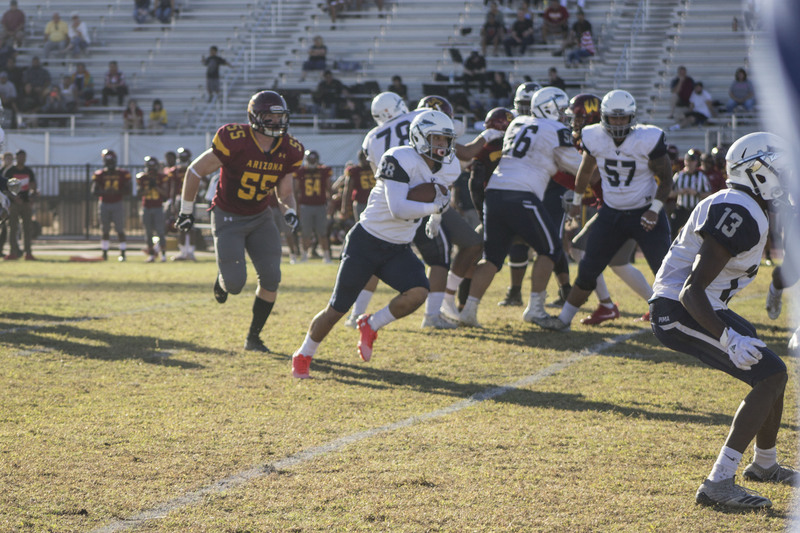 For the final regular season game in Aztecs’ football history, the Aztecs hit the road to Yuma to take on the Arizona Western College Matadors. The No. 16-ranked Aztecs fell just a bit short in a back-and-forth battle with the Matadors by the final score of 24-20. The Aztecs were in business late as they were up 20-17 when Sophomore Macarius Blount intercepted a pass, giving the Aztecs the ball with just 2:18 left on the clock. The offense was not able to convert a first down, which led to a punt and only took 27 seconds off the clock. The Matadors started their six-play, game-winning drive from their 42-yard line and ended with a 1-yard touchdown run from quarterback Logan Byrd. The Aztecs started slow, going down 10-0, but the team rallied back, when Larry Rembert brought in a 36-yard reception and setting up a 2-yard touchdown run from quarterback Brooks Ringer. Just a few plays later, Sophomore Garius Thompson intercepted a pass and returned it 60 yards for the touchdown to put the Aztecs up 13-10. To start the third quarter, the Aztecs were driving down the field when the Matadors picked off Ringer and returned it 82 yards to bring the score to 17-13. Ringer rebounded on the next drive to put them back up 20-17. The game-winning drive for the Matadors was unable to be matched. The prior week, the No. 11 Aztecs traveled out of state to Ephraim, Utah, to take on the No. 8-ranked Snow College Badgers. Unfortunately the Aztecs left in defeat with the final score of 64-17. The defense struggled mightily, giving up a total of 535 yards of offense to the Badgers. From the beginning, the Badgers were scoring with ease as they jumped out to an early 27-3 lead. The offense was able to score a touchdown early in the second quarter to cut the lead to 27-10 with a four-play, 77-yard drive capped off by a touchdown pass thrown by Ringer to Sophomore Jon Cole. The Badgers scored the next 23 points unanswered, thus pushing the score to 50-10 and sealing the victory for the Badgers. Ringer also threw a 65-yard touchdown pass to Freshman Jordan Porter in the third. The offense managed to rack in 226 in the air with Ringer going 17-23 and on the ground they had 77 yards. The Aztecs are looking for a rebound performance against the Kilgore College Rangers when they face off on Dec. 1. They will be trying to avoid dropping three straight games in their final stretch as a program.